**The Barracuda Email Security Gateway 100 is limited to 50 email addresses, 6 month Energize Updates and Instant Replacement available on initial setup only. The Barracuda Email Security Gateway is an email security gateway that manages and filters all inbound and outbound email traffic to protect organizations from email-borne threats and data leaks. As a complete email management solution, the Barracuda Email Security Gateway lets organizations encrypt messages and leverage the cloud to spool email if mail servers become unavailable. The Barracuda Email Security Gateway is offered without per-user or per-feature fees, and is also available as a virtual appliance or in a public cloud environment (Amazon Web Services (AWS), Microsoft Azure, or VMware vCloud Air). For hosted email security, see Barracuda Email Security Service. The Barracuda Email Security Gateway includes spam and virus blocking, data protection, large file transfer, email continuity, DoS prevention, encryption, and policy management-combined to deliver a complete solution. As new requirements emerge, it is automatically updated with new capabilities to ensure continuous protection. The Barracuda Email Security Gateway provides multi-layer security, email continuity, and data leakage prevention. Advanced Threat Detection combines behavioral, heuristic, and sandboxing technologies to protect against zerohour, targeted attacks and ransomware. Fast, easy set-up and simple, intuitive management keep time and resource needs low. The integration of the Barracuda Cloud Protection Layer and no per-user fees make it easy and very affordable to scale capacity as your business grows. 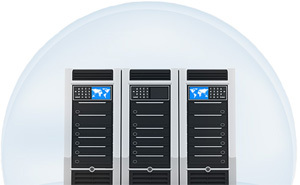 Barracuda Cloud Protection Layer filters and spools inbound email traffic. Today's IT professionals need a comprehensive email security solution to block email-borne attacks while providing the extra features needed to ensure business continuity-at one affordable price. Secure inbound email traffic against email-borne threats. With the Barracuda Email Security Gateway, protecting against inbound malware, spam, phishing, and Denial of Service attacks ensures that business productivity isn't impacted by attacks through the email system. Powerful and customizable policies enable further enforcement of detailed requirements that govern inbound email messages. Offload CPU-intensive tasks to the cloud, like antivirus and DDoS filtering, to reduce processing load on the appliance and ensure threats never reach the network perimeter. The Barracuda Email Security Gateway is integrated with a cloud-based service that pre-filters email before delivery to the onsite Barracuda Email Security Gateway, which performs further inbound security checks and outbound filtering. Ensure that email is available even when mail servers fail. Because email is a critical vehicle by which today's businesses operate, a failure of the email server can significantly limit business operations. With the Cloud Protection Layer, bundled free of charge with the Barracuda Email Security Gateway, email is spooled for up to 96 hours, with an option to re-direct traffic to a secondary server. Leverage powerful encryption technology to ensure sensitive data cannot be viewed by outside parties. Outbound filtering and quarantine capabilities ensure that every outbound email complies with corporate DLP policies. Configurations on the Barracuda Email Security Gateway are simple and easy to deploy, ensuring customized email protection is in place in a matter of minutes. Day-to-day management is enhanced through cloud-based centralized management that is included without additional fees. The affordable, all-inclusive pricing model requires no per-user fees, minimizing the investment in securing your email infrastructure. The Barracuda Email Security Gateway leverages Barracuda Central to identify email from known spammers and determine whether domains embedded in email lead to known spam or malware domains. It leverages many of the same industry-leading techniques found in the Barracuda Email Security Gateway that protect against attempts to embed text inside images with the intent of hiding content from traditional spam filters. As virus attacks become more sophisticated and complex, email infrastructure requires advanced virus protection. The potential for the destruction and release of information, or the disruption of a network severely impacts productivity and can lead to financial loss. The Barracuda Email Security Gateway scans email and incoming files using three powerful layers of virus scanning technology. It also decompresses archives for complete protection. Powerful virus definitions are automatically updated via Energize Updates to maintain the most up-to-date protection against email-borne viruses. To provide protection from tainted internal email, a Microsoft Exchange Plug-In allows organizations to protect against the spread of viruses that don’t access the email gateway. The virus definitions are also regularly updated to ensure the latest protection. All Barracuda products are supported by Barracuda Central, a 24x7 advanced security operations center that works continuously to monitor and block the latest Internet threats. Barracuda Central collects data from more than 150,000 collection points worldwide and analyzes it to develop defenses, rules, and signatures. As new threats emerge, Barracuda Central is quick to respond to early outbreaks and delivers the latest definitions through Barracuda Energize Updates. These updates require zero administration and ensure that the Barracuda Email Security Gateway provides comprehensive and accurate protection against the latest Internet threats. Not every attack is focused on getting users to send their credit card number, getting users to click on a malicious link, or to plant a virus. Often, the objective of the attack is focused on disabling a network or mitigating its effectiveness. As a cloud-based service, the Barracuda Email Security Gateway is positioned to stop spammers before they overload an email server. The Barracuda Email Security Gateway ensures that email can still be delivered even during email server failures or loss of connectivity. In the event of on-premises disruptions, email can be spooled in the Cloud Protection Layer for up to 96 hours. An alternate destination can also be specified for delivery, if delivery to the primary destination fails. During email server outages, the email for all mail servers is visible through the Cloud Protection Layer. From the message log, you can see the status of all spooled emails, and whether mail has been re-delivered. The Barracuda Email Security Gateway is integrated with a cloud-based service that pre-filters email before delivery to the on-site Barracuda Email Security Gateway. The Cloud Protection Layer is continuously updated with definitions in real time with updates from Barracuda Central. The elasticity of Barracuda’s global cloud infrastructure provides the flexibility to handle email surges during specific periods of the day and during Denial of Service attacks. The Cloud Protection Layer ensures that an organization’s email security infrastructure scales with the increasing growth in email volume and attachment sizes; as well as the growth of companies. By leveraging the bandwidth and computing power of the CPL, organizations can easily scale their email security solution. The Barracuda Email Security Gateway offers a number of encryption features. It is fully integrated with a cloud-based email encryption service for outbound email. Email that matches policy or are marked for encryption via the Barracuda Outlook Add-in are securely sent via TLS to the Barracuda Message Center. Outbound filtering prevents organizations from being put on spam block lists and prevents sensitive data in email from leaving the organization. Employees can inadvertently cause internal systems to become a source for botnet spam. Using a subset of its defense layers, the Barracuda Email Security Gateway’s outbound filtering stops outbound spam and viruses. It also lets administrators enforce content polices for data loss prevention (DLP) and to meet other content standards in outgoing email. Predefined filters and custom policies can be used to detect sensitive data and block or encrypt email. 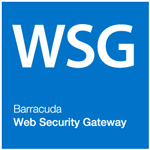 The Barracuda Email Security Gateway is integrated with the Barracuda Cloud Control (BCC) web-based management portal, which leverages Barracuda’s global cloud infrastructure to enable organizations to centrally manage all their devices through a “single pane of glass” interface. Administrators gain a global view of all their devices or services as well as centrally manage policies and configuration. The simple interface makes it easy for small and medium-sized organizations to implement and manage the service with minimal IT overhead. The Barracuda Email Email Security Gateway is delivered with all features and capabilities fully enabled. Inbound and outbound email filtering, encryption, and email continuity are all offered as a simple, all-inclusive subscription without any per-user fees. 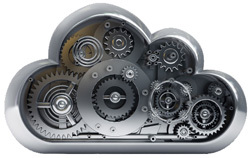 The Barracuda Cloud Control management portal is included free of charge. There are eight models of the Barracuda Email Security Gateway. A single Barracuda Email Security Gateway can handle up to 100,000 active email users. Multiple units can be clustered together for even greater capacity and high availability. These specifications are not limits of the system, but are the recommended capacity. 1 Advanced Threat Detection (ATD) is available as an add-on subscription. Advanced Threat Detection1 to protect against ransomware, zero hour and targeted attacks. The Barracuda Email Security Gateway is a comprehensive email security solution that manages all inbound and outbound email traffic to protect organizations from email-borne threats and data leaks. Flexible deployment options include hardware and virtual appliances, cloud services and hybrid configurations - making this solution ideal for safeguarding any size organization. In addition to protecting traffic to and from the Internet, the solution also includes a Microsoft Exchange Anti-virus Agent to protect internal emails. Widely used by over 75,000 organizations, the award-winning Barracuda Email Security Gateway has no per-user, per-agent or per-server fees. Barracuda Email Security Gateway's comprehensive features and functionality yield a phenomenal 95 percent spam catch rate out of the box with one of the lowest false positive rates in the industry. Although affordable and easy to use, the Barracuda Email Security Gateway provides the most effective and complete email security in the industry. The Barracuda Email Security Gateway's multilayered approach to email security provides the most comprehensive protection available. It also optimizes email performance several ways to affordably process millions of messages per day. Its internal filtering technology employs time-tested defense layers while the Cloud Protection Layer adds advanced cloud-based technologies: the Barracuda Anti- Fraud Intelligence Engine detects and blocks fraudulent emails and the Barracuda Anti-Virus Supercomputing Grid detects and blocks polymorphic viruses that try to evade detection by changing their signatures. All Barracuda Networks products are backed by Barracuda Central, a 24x7 advanced technology center consisting of highly trained engineers who continuously monitor and block the latest Internet threats. Barracuda Central collects emails, URLs and other data from tens of thousands of collection points located in more than 80 countries. In addition, Barracuda Central collects data contributions from more than 50,000 Barracuda products in use by customers. Barracuda Central analyzes the data collected and develops defenses, rules and signatures to defend your network. As new threats emerge, Barracuda Central is quick to respond to early outbreaks and delivers the latest definitions through Barracuda Energize Updates. These updates require zero administration and ensure that the Barracuda Email Security Gateways provide comprehensive and accurate protection against the latest threats. 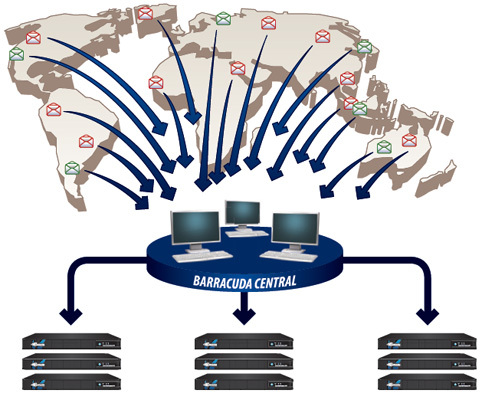 Barracuda Central monitors data 24x7 from tens of thousands of collection points located in over 80 countries and more than 40,000 Barracuda Email Security Gateways in use by customers. As new threats emerge, Barracuda Central is quick to respond to early outbreaks and delivers the latest definitions automatically through Barracuda Energize Updates.P address. Barracuda Central collects IP addresses used in spam attacks and legitimate email campaigns for reputation analysis. 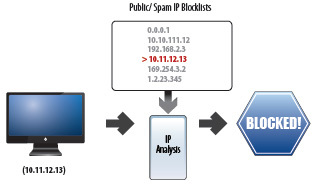 Reputation analysis lets the Barracuda Email Security Gateway filter look up senders' IP addresses on Barracuda Networks' block or allow lists. "Grey area" addresses are analyzed through nine other defense layers. Reputation and other upfront checks let the Barracuda Email Security Gateway block over half of emails in the connection-management layers before emails are received. With Barracuda Reputation analysis, the Barracuda Email Security Gateway can quickly and efficiently make decisions to block or accept email messages based on the sender's IP address. The Barracuda Email Security Gateway scans emails and incoming files using three powerful layers of virus scanning technology. It also decompresses archives for complete protection. This triple-layer antivirus protection uses powerful open source and propriety virus definitions, which automatically update via Energize Updates and Real Time Protection. Virus scanning takes precedence over other email scans. Barracuda Email Security Gateways worldwide collectively block more than one million virus attempts on a typical day. Barracuda Networks triple-layer virus protection includes powerful open source and proprietary virus definitions and Barracuda Real-Time Protection for the most comprehensive email-borne virus and malware protection in the industry. With its antivirus agent for Microsoft Exchange, the Barracuda Email Security Gateway protects internal emails. Viruses can easily enter an internal email system through the use of Outlook Web Access or POP/IMAP on systems not under the organization's control. The agent runs as a Windows service on the Exchange server letting the server scan internal emails for viruses. It uses the same virus definitions as the Barracuda Email Security Gateway. Configuring and monitoring the agent are also done via the Barracuda Email Security Gateway's intuitive web interface. The Barracuda Email Security Gateway provides a single place for managing inbound, outbound and internal email virus protection. The antivirus agent for Microsoft Exchange protects internal emails. Barracuda Real-Time Protection is a set of advanced technologies that lets the Barracuda Email Security Gateways instantly block the latest viruses and other malware as they emerge. It draws from the largest and most diverse installed base in the industry to detect early trends in email threats. Immediately upon virus or malware classification, Barracuda Real-Time Protection sends a response via Barracuda Central to any Barracuda Email Security Gateway that has submitted the malware fingerprints to block the message. This, plus a third layer of antivirus protection, enables the fastest response to email-borne virus threats in the industry. Barracuda Real-Time Protection draws from the largest and most diverse installed base in the industry to detect early trends in email-borne threats. Immediately upon virus or malware classification, Barracuda Central responds to any Barracuda Email Security Gateways submitting the corresponding fingerprints with an instruction to immediately block the message. The Cloud Protection Layer stops spam and malware in the cloud. It also provides email continuity. The Barracuda Email Security Gateway also filters outbound emails. Outbound filtering prevents organizations from being put on spam block lists and prevents sensitive data in emails from leaving the organization. Employees can inadvertently cause internal systems to become a source for botnet spam. Using a subset of its defense layers, the Barracuda Email Security Gateway's outbound filtering stops outbound spam and viruses. It also lets administrators enforce content polices for data loss prevention and to meet other content standards in outgoing emails. Predefined filters and custom policies can be used to detect sensitive data and block or encrypt emails. Outbound filtering protects organizations from being placed on spam block lists and leaking sensitive data in emails. The Barracuda Email Security Gateway offers a number of encryption features. It is fully integrated with a cloud-based email encryption service for outbound emails. Emails that match policy or are marked for encryption via the Barracuda Outlook Add-in are securely sent via TLS to the Barracuda Message Center. The Barracuda Message Center uses AES with 256 bit keys to encrypt emails. To encrypt email traffic between sites over the Internet, the Barracuda Email Security Gateway Message Transport Agent supports SMTP over TLS. This can be used between Barracuda Email Security Gateways or other email servers that support SMTP over TLS. Outbound email encryption protects sensitive data in emails. It provides secure transit and storage for emails. 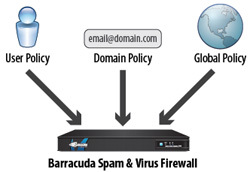 Barracuda Email Security Gateway offers per-user, domain and global policy management. Built for the diverse needs of small and medium businesses, enterprises, educational institutions, government institutions and ISPs, the Barracuda Email Security Gateway offers global, domain-level, and individual user policy control. Depending on the model, policies can be combined and customized for maximum flexibility. Several spam-scanning features can be customized for each email user including block lists, allow lists, quarantining, scoring thresholds and Bayesian analysis. Domain-level features for policy management include: inbound and outbound quarantines, outbound encryption, block and allow lists based on IP address or sender/ recipient email address or domain, reporting, and recipient validation via LDAP. Based on the Linux open source kernel long popular with security researchers, the Barracuda Email Security Gateway's OS is hardened for maximum security and stability. In addition to thorough internal testing, Barracuda Networks collaborates with the community of "white hat" security researchers who work with security vendors to uncover and resolve potential vulnerabilities in both the Linux operating system and its associated utilities. While the vast majority of technology in the Barracuda Email Security Gateway is proprietary, Barracuda Networks seeks to leverage secure and functional open source alternatives whenever possible. Barracuda Central is the 24/7 security center operated by Barracuda Networks to monitor and block the latest Internet threats. Data collected at Barracuda Central is analyzed and used to create definitions for automatic Energize Updates that fuel the Barracuda Email Security Gateway. Barracuda Central is backed by Barracuda Labs, a global multidisciplinary research and threat analysis team that develops innovative technologies across Barracuda Networks' business areas. Barracuda Lab evaluates the threat ecosystem and creates security intelligence for distribution via Barracuda Central to defend customers. The Barracuda Email Security Gateway features a robust Message Transport Agent (MTA) capable of handling high SMTP connection and mail delivery volumes. For inbound protection, the MTA includes rate controls, IP reputation analysis, sender authentication, and recipient verification, which allow it to reject SMTP connections before it actually receives any messages. For relaying outbound mail, the Barracuda Email Security Gateway supports access controls and SMTP Authentication to ensure that the Barracuda Email Security Gateway safely relays email without risk of acting as an open relay. The outbound mail relay also performs rate control checks based on sender IP address or sender email address. The Barracuda Email Security Gateway MTA also supports a built-in journaling function for use with message archivers. The Barracuda Email Security Gateway provides email continuity in case of disasters through its Cloud Protection Layer. In the event of on-premises disruptions, emails can be spooled in this cloud layer for up to 96 hours with attempts to resend the spooled messages at preset intervals. An alternative destination can also be specified for email delivery if delivery to the primary destination fails. The Barracuda Email Security Gateway offers role-based administration which features a number of built-in account roles. Management tasks can be delegated based on account roles such as Admin, Domain Admin, and Helpdesk. Domain administration can be delegated to the Domain Admin or to Helpdesk roles, which can be assigned to specific users. The Barracuda Email Security Gateway can cluster multiple nodes for redundancy and to increase capacity. For central management, Barracuda Email Security Gateways share configurations and policy across the cluster. Administrators can change policy and access any message received across the cluster from any node. For redundant quarantine mail storage, all quarantined messages are stored in at least two nodes in the cluster - ensuring message availability if one node fails. Barracuda Email Security Gateway clusters can create redundancy across sites as well. How does the Barracuda Email Security Gateway protect against email threats? The Barracuda Email Security Gateway, an integrated hardware and software solution, uses a multilayered approach to provide the most comprehensive email protection available against spam, viruses, spoofing, phishing and spyware attacks. An added benefit of the Barracuda Email Security Gateway is the optimized processing of each email to maximize performance and capability to filter millions of messages per day. Behind the industry-leading initiatives of Predictive Sender Profiling and Barracuda Real-Time Protection are 12 explicit defense layers including: Denial of Service and Security Protection, Rate Controls, IP Reputation Analysis, Sender Authentication, Recipient Verification, Virus Protection, Policy (user-specified rules), Fingerprint Analysis, Intent Analysis, Image Analysis, Bayesian Analysis, and a Spam Rules Scoring engine. Deployed at the network perimeter, all incoming email must pass through all 12 defense layers of the Barracuda Email Security Gateway before any of it can reach the intended recipients. 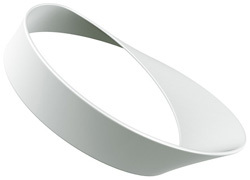 The defense layers are grouped into two main classes: connection management, which involves dropping incoming mail connections before receiving messages, and mail scanning, which analyzes messages upon receipt. During the filtering process, emails are checked for new and familiar spammer attacks, viruses, and customized administrator policy violations. Based on administrator and user preferences, spam can be tagged, quarantined or blocked. Why tag email? What happens to tagged emails? Tagging email benefits organizations by easily identifying messages that meet set criteria. Tagged emails are delivered to the recipient with a customizable label, such as [BULK], that is added to the subject of the message. Why quarantine email? What happens to quarantined email? Quarantining emails is a safeguard that allows for examination of questionable messages prior to accepting or rejecting; typically, quarantined email does turn out to be spam. An administrator can choose two types of email quarantine: global or per user quarantine. When configured for global quarantine, the Barracuda Email Security Gateway routes all quarantined email to a mailbox specified by the administrator. When configured for per user quarantine, the Barracuda Email Security Gateway stores the email locally and notifies users periodically of their quarantined email. Users can choose to delete quarantined email, forward it to their own mailboxes or whitelist the sender address to prevent future email from being quarantined. Per user quarantine is available with the Barracuda Email Security Gateway 300, 400, 600, 800 and 900 models. What are some of the underlying technologies used in the Barracuda Email Security Gateway? The Barracuda Email Security Gateway uses a combination of proprietary and open source software. The Barracuda Email Security Gateway operating system is based on a hardened, stable Linux kernel that has undergone strict scrutiny by top security researchers. The robust MTA is capable of handling a high number of SMTP connections and mail delivery volumes. Starting with firmware release 3.5, the Barracuda Email Security Gateway MTA has a built-in journaling function that can be used in conjunction with the Barracuda Message Archiver. If I am using Microsoft Exchange, how will the Barracuda Email Security Gateway protect against “dictionary” attacks? The Microsoft Exchange Accelerator, available on Barracuda Email Security Gateway 300 and higher, uses the Lightweight Dictionary Access Protocol (LDAP) built into Exchange to verify recipients before delivering messages to the Microsoft Exchange Server. What new technologies has the Barracuda Email Security Gateway added to combat the latest spam campaigns? Multi-Pass Optical Character Recognition Engine: Image spam generally embeds text within images with the intent of hiding content and bypassing the text rules processing layers of spam filters. With Barracuda Networks' industry-leading multi-pass OCR engine, Barracuda Email Security Gateways render the spammers' tricks to hide text behind color or blurred images ineffective. Predictive Sender Profiling: Barracuda Networks' industry-leading Predictive Sender Profiling probes deeper into sent email and digs into the campaign itself to identify anomalous sender activity, allowing Barracuda Networks to effectively block spam typically unstoppable by traditional reputation analysis. Barracuda Real-Time Protection: Barracuda Real-Time Protection uses an advanced set of technologies to immediately block the latest virus, spyware and other malware attacks as they emerge. Leveraging the Barracuda Email Security Gateways large and diverse customer base, Barracuda Networks leads in industry in detecting early trends and responding to email-borne threats. How does the Barracuda Email Security Gateway protect against virus threats? The Barracuda Email Security Gateway provides comprehensive protection against virus threats through three powerful layers. The first layer consists of a well-respected open source virus scanning engine. The second layer is a proprietary virus engine maintained by Barracuda Central, an advanced 24/7 security operations center that works to continuously monitor and block the latest Internet threats. The third layer is Barracuda Real-Time Protection, a set of advanced technologies that enable Barracuda Email Security Gateways to immediately block the latest virus, spyware and other malware attacks as they emerge without having to wait for a signature to be downloaded onto the Barracuda Email Security Gateway. How does the Barracuda Email Security Gateway block real-time threats? Barracuda Central engineers diligently work 24x7 monitoring spam and virus threats around the world. Since response times are crucial with real-time threats, when one is detected the Barracuda Email Security Gateway uses Barracuda Real-Time Protection to mitigate these threats as they emerge without waiting for new updates. How much time will I spend installing and maintaining the Barracuda Email Security Gateway? The Barracuda Email Security Gateway is designed as an easy-to-install appliance requiring minimal administrative overhead. Without any tuning, the Barracuda Email Security Gateway offers a 95 percent spam accuracy rate with a 0.01 percent false positive rate. Taking into account the six defense layers automatically tuned by Energize Updates, the Barracuda Email Security Gateway is easily kept up-to-date for ongoing spam accuracy. Will I receive a high number of false positives using a Barracuda Email Security Gateway? With no tuning, the Barracuda Email Security Gateway is set to minimize false positives, typically at 0.01 percent or less - one of the lowest false positive ratings in the industry. As with any solution that allows for user customization, each customer's false positive return will vary depending on how the administrator tunes the unit (i.e. a stricter spam score setting may result in more false positives). What does Energize Updates include for the Barracuda Email Security Gateway? The Barracuda Energize Updates subscription provides the latest spam and virus definition updates that block new campaigns before they become an outbreak. Barracuda Central engineers constantly update spam and virus definitions and are able to remotely tune six of the 12 defense layers, thereby minimizing administration time. Energize Updates also gives you access to technical support, new firmware releases and the opportunity to participate in the Barracuda Early Release Firmware program. Does the Barracuda Email Security Gateway offer per user policies? Per user policies are available in Barracuda Email Security Gateway 300 and higher. Per user policies empower users with the ability to set their own individual scoring policies, Bayesian database, allow lists and block lists. Can the Barracuda Email Security Gateway filter outbound messages? Yes. The Barracuda Email Security Gateway filters outbound messages for viruses and basic spam scanning policies. For advanced outbound scanning, Barracuda Networks offers the Barracuda Email Security Gateway-Outbound which includes different workflows for quarantining outbound email traffic for review by policy auditors. How do I block or minimize the amount of invalid bounce messages? Invalid bounce messages are non-delivery reports to forged email addresses. To block invalid bounce messages, enable the Invalid Bounce Suppression feature and relay all your outgoing email through the Barracuda Email Security Gateway or the Barracuda Email Security Gateway-Outbound appliance. Does the Barracuda Email Security Gateway enable administrators to block email from other countries? Based on a Reverse DNS lookup, administrators block messages whose top level domain resolves to a country's hostname. Based on the declared character set of an email, administrators block messages that contain a specific language set. While it is not recommended by Barracuda Networks, administrators create custom policies to filter other patterns in the subject, header or body to block unwanted email from other countries. How do I know which Barracuda Email Security Gateway model is best suited to my needs? A local Barracuda Networks sales representative can evaluate your environment based on the number of active users, email traffic and desired features. As your organization expands, the Barracuda Email Security Gateway can be clustered to accommodate your additional growth. What if I have more questions about the Barracuda Email Security Gateway? Data migration service for Barracuda Email Security Gateways. Barracuda Networks will assist movement of data and configuration from the old product to the new product if the old data is accessible.